My infatuation for wildlife watching came at a young age on a suburban sofa, transfixed by the images appearing on the television. Cousteau and Attenborough showed me creatures more bizarre than even my childhood imagination could invent. I ached to set sail on a ship like Calypso and explore the underwater world that I now knew existed but had never seen with my own eyes. Baja California Sur is the place where you can star in your own nature documentary. The vast, cactus scattered landscape contrasts dramatically with the rich cetacean filled seas and the encounters you have will be intimate to the point of intimidating! You’ll be searching desperately for your camera crew to the capture the humpbacks breaching, dolphins playing, whale sharks gliding and grey whales so close to the boat you can stroke them. If you look at Mexico on a map, you’ll see a long, thin peninsula on the west coast. This is Baja California and it’s a feeding and breeding spot for great whales. The whole peninsula is too vast to explore on a 10 day vacation but, by concentrating your efforts in the south, you’ll see the highlights of what the area has to offer. 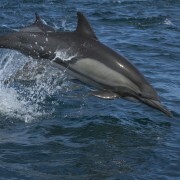 Starting in Cabo San Lucas, you can leave the ‘Spring Breakers’ to drink tequila in the bars and the ignorant tourists to visit the pointless dolphinarium, to sail with a pod of wild dolphins, marvel at the humpbacks’ surface behaviour and dive in the ray filled waters. After less than 2 hours driving north, you’ll reach La Paz (leaving the pure pleasure tourists to their sunbeds). ‘Lifetime memories are made here’ should be La Paz bay’s motto. A one hour boat trip will take you to Los Islotes, a small island, which is probably the best place on the planet to dive or snorkel with sea lions. The pups are particularly playful, bringing you starfish, nibbling your fins and looking at their reflections in your masks. A nearby wreck offers a fabulous scuba site or, if you’re overwhelmed by the sea lion frenzy, you can relax with a SUP board in the crystal clear waters of the neighbouring beaches. A perfect way to finish a day exploring La Paz bay is by searching for whale sharks. In the late afternoon, the biggest fish in the ocean is in feeding mode. You’ll get an instant adrenaline rush by hopping in the water and swimming right next to these huge but harmless sharks (no touching though). The final stop on this trip of a lifetime is San Ignacio Lagoon. It’s a 5 hour drive north of Loreto (12km on unmade roads so a 4×4 is preferable) and you end up in the middle of nowhere at Kuyima Ecotourism. The accommodation consists of tents or cabins and bucket showers; however, this is my favourite spot in Baja California Sur. The stars are awe-inspiring, the food is heavenly and the staff are angels. But all of that pales in comparison to what you’ll experience out in the lagoon. Grey whales come here to mate and give birth and the mothers stay to teach their calves how to swim in the different depths and salinity of water. 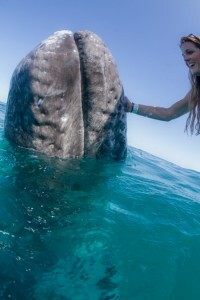 These whales are notoriously friendly and will approach the boats for a rubdown! I don’t normally encourage petting wild animals but these cetaceans seem to actively seek the affection. For me, looking into the eyes of a grey whale, and feeling the mutual curiosity, is the most humbling of wildlife experience of them all. To explore Baja, I flew to Los Cabos International Airport and hired a 4×4. 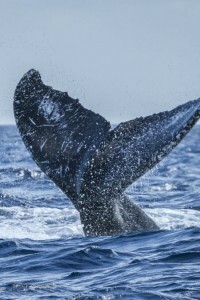 In Cabo San Lucas, I dived and whale watched with Manta Scuba . 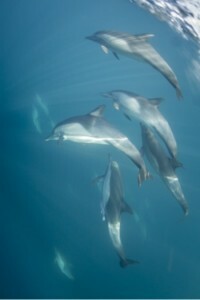 In La Paz, I snorkelled and dived with Baja Expeditions . In Loreto I went whale and dolphin watching with Loreto Blue Whale and in San Ignacio Lagoon I whale watched with Kuyima Ecotourism . Depending on which animals you most want to see will depend on what time of year to visit Baja California Sur but I’d recommend late February or early March.